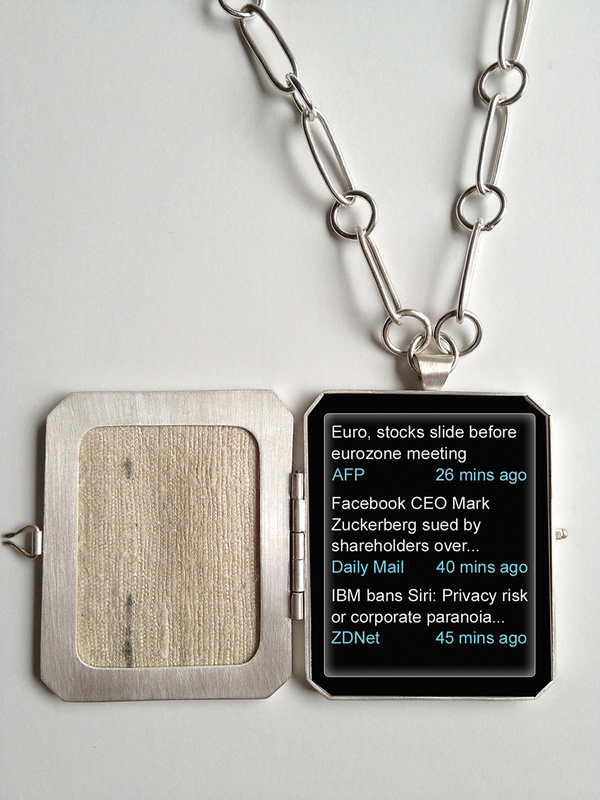 Patricia Sullivan: “Widget Locket #1: Homage to Old Technology”. Sterling silver (fabricated), Katan silk, plexiglas, archival paper, 20.75″ x 1.75″ x .25″, 2012. This past month, November, has been a whirlwind of excitement for me. Within days of each other I received word that two of my jewelry pieces have been accepted into two different international juried exhibitions. The first one is a fine contemporary craft exhibition coming up in December in North Carolina (a true epi-center lately for the East Coast U.S. craft world) and the second is a juried group show of contemporary art in northern New Jersey. Both shows received over 460+ entries worldwide, and in both cases, only 38-40 works were chosen for each event. I feel extremely fortunate to be able to introduce a piece at each show from my new body of jewelry/metal work. The series is called “widget lockets” – pieces fabricated entirely by hand in sterling silver (this includes a handmade oval sterling chain, clasp, bail and constructed hinge), with the addition of mixed media such as silk, plexiglas/acrylic, graphic 2-D elements created in Adobe Illustrator, printed in color on archival paper and set inside. To give an idea of what I’m essentially trying to discuss through these pieces: just like Victorians memorialized their loved ones in the historic pieces known as “mourning jewelry” – these lockets are an homage to a “dying” or near-outdated technology, such as lockets that incorporate news streams or short snippets of current headlines that scroll across computer screens/monitors. Patricia Sullivan: “Widget Locket” (rear detail), fabricated sterling silver, 2012. P. Sullivan: “Widget Locket” (inside detail), 2012. These images of my silver lockets are “fresh from the bench” – however, I am planning to get professional photographs taken. It always poses a challenge to get good images with such reflective surfaces like metal and plexiglas. I hope to be writing my next blog post on artdoesmatter with critiques of others’ fresh, new artwork viewed in-person at one of these two upcoming group exhibitions. Stay tuned! All images, creative concepts and objects pictured in this blog entry are copyright-2012 Patricia Sullivan / artdoesmatter and may not be used or duplicated without my permission. Congratulations Patti. It really is a fabulous achievement. Looking forward to following your success. Thank you, Annemarie – and I appreciate the follow! Thanks, Denise! Always good to hear from you! Congratulations on the acceptances, well deserved. Lovely design, I like the totally hand-made aspect, and the startling effect of the contemporary text. Not sure if Mark Zuckerberg would like to have his brainchild referred to as a ‘fading technology’, but you are right. Thanks so much Pete for commenting – I love your “read” on my work! Looking forward to seeing more of your new work, as well! Love it. The whole concept, so thoughtful. The chain is lovely too. Congratulations to you and best of luck. So impressed. Thanks urban rustic! I genuinely appreciate your encouraging words about my work. Patricia, congratulations! So difficult to get into those shows! Your work is beautiful and intriguing as always. Best of luck with the shows and I look forward to seeing more of your jewelry. Anita, thank you so much. I feel VERY lucky to have been accepted into two shows; I applied to three, and I’m in shock that the odds worked in my favor to get accepted to two of them! I genuinely appreciate your kind words! Stitchedupmama – you are way too kind. Thanks so much for your lovely compliments; you make me think I’m “all that!” – :D. I can’t possibly tell you how much I’m enjoying your blog, and love your latest “pocket” pieces. Your work is very inspiring – I love to see what you come up with each time I check out your blog! Congratulations on having your work accepted in two shows! And it’s great to see there is a lively crafts scene in your part of the world. I like your brand new take on mourning jewery. Attention to details, use of mixed media, and quality of execution – all contribute to bringing to life an original and meaningful piece of jewelry. I look forward to reading your next posts and seeing more “fresh” work. Hi metalandmettle, thank you for your lovely comments on my new work; I’m equally enjoying reading your blog; we metalsmiths seem quite rare to these blog pages. I’m always looking forward to seeing more of your work, as well as your most inspiring post re: Peruvian metal arts. Keep your wonderful posts coming! And thank you for visiting artdoesmatter! Thanks for posting this wonderful work. You really flatter me, gentlestitches! I’m enjoying seeing all your creative projects and following your blog equally as much! Thanks so much for your nice comments. Thanks Kartika – I appreciate your kind compliments and the follow; I’m now following your blog as well. (I’m also a latte-drinker and arugula-eater!) Very nice to meet you. Patricia Sullivan’s exquisite (and interesting) work, recently accepted for two prestigious shows in eastern US. I have reblogged this today. Sharing your success (and your work). Congratulations Patricia! Oh Philippa, thank you so much! That is very gracious and so wonderfully kind. I genuinely appreciate it! Best of luck with your current show/exhibit of your paintings!